Shudraka, the playwright of the well-known Sanskrit play Mrichchakatika (The Little Clay Cart), belonged to the hoary years even prior to the beginning of the first Christian millennium. There is one theory that he wrote under the pseudonym of Shudraka, meaning a "low-caste servant", to imply that he actually completed an unfinished play by Bhasa, Charudattam, calling himself 'the servant' of the well-known dramatist. The other conjecture is that he was, on the contrary, a mighty king of his time. Whatever the reality about the author, the play was a striking departure from the prevailing forms of drama, of necessity, to be written about the royalty and noblemen, as enumerated in the Natya Shastra and, instead, incorporates a large number of peasant characters who speak a wide range of Prakrit dialects. Remarkably enough, the play has been widely staged not merely all over India, but also in the West, namely as a highly romanticized French adaptation, Le Chariot d'enfant, that premiered in Paris in 1850, as well as a critically acclaimed 'anarchist' interpretation, called Le Chariot de terre cuite that was produced by the Theatre de l'oeuvre in 1895. Discarding the trapping from either epics or mythology, the characters of Shudraka are drawn from the mundane world, peopled with gamblers, courtesans, thieves and so on. 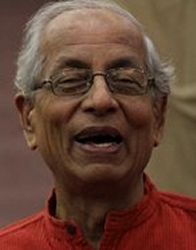 The protagonist of the play, Charudatta does not belong to the noble class or royal lineage. Though Vasantasena is a courtesan, her exemplary attitude and dignified behavior impress the spectators. The nobility of these characters does not stem from their social conditioning but from the inner virtues and behavior. Rich but characteristically truthful, her inherent honesty indulges her to forsake all her treasures and ornaments, and embrace the honest, yet destitute Charudatta. 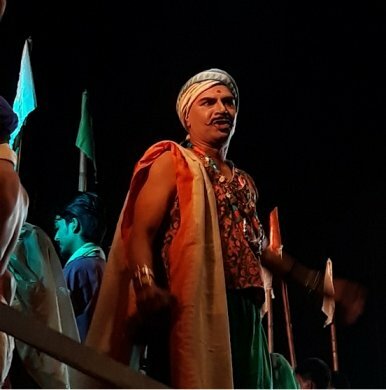 Matir Gadi Mrichchakatika presented by 'Naye Natua' on February 27, was a delightfully crafted visual play doing full justice to Shudraka's kind of almost comedia del'arte theme. 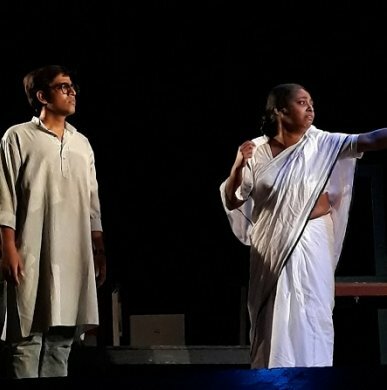 With music, acting and direction by the versatile Goutam Halder, it was made into a hilarious stage experience that the viewers responded to most enthusiastically throughout its duration. Goutam's soulful singing from behind the wings comprised a scintillating rendition of the classical ragas like Desh, Malkauns, Kafi, Malhar, et al., matched equally competently by Dyuti Ghosh Halder in the lead role of the courtesan, with her vivacious forays into Kathak tatkars, gat bhav, gat nikas and thaat. She took one's breath away because of the very freshness of her choreographic approach. The ensemble acting was also of top quality. Goutam's own acting prowess reached a peak in the pivotal character of Shudraka, the king's brother-in-law; rich, mighty and a thorough rogue. The only blemish was the random use of English, Bengali and even Hindi and Oriya expletives. This was hardly needed in a classic Shudraka production, remembering such illustrious Indian precedents as Habib Tanvir's Mitti Ki Gadi that has remained ever green in the audience memory. The director will do well to weed out these totally unnecessary embellishments from his memorable directorial venture! Sei Personaggi in Cerca d'autore (Six Characters in Search of an Author) was a famous Italian play by Luigi Pirandello, written and first performed in 1921. An absurdist meta-theatrical play about the relationship among authors, their characters and theatre practitioners, it premiered at a theatre in Rome to a mixed reception, with shouts from the audience of "Manicomio!" (madhouse) and "Incommensurabile!" (incommensurable), a reaction to the play's illogical progression! Reception improved at subsequent performances, especially after Pirandello provided, in 1925, a foreword clarifying its structure and ideas. The play had its American premiere in 1922 on Broadway and was performed for over a year off-Broadway, beginning in 1963. Astonishingly, this play - together with his Henry the Fourth - has remained the only two most often-performed works by Pirandello, out of his equally remarkable oeuvre of 44 plays, in all! Kothakar Charitra Kothay Rekhechho? (Where have you placed the characters gathered from nowhere in particular?) 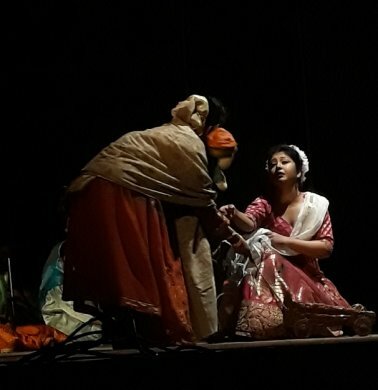 premiered by 'Sansriti' on February 24, was a somewhat fanciful re-naming of an earlier adaptation of the same Pirandello play Six Characters..., by Rudraprasad Sengupta of Nandikar group also having successfully produced the play to the Kolkata audience. 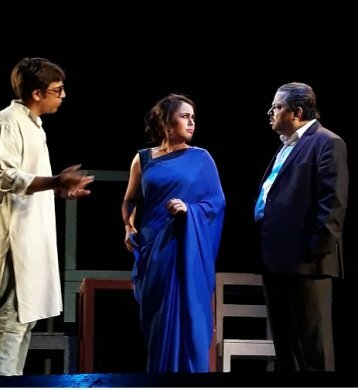 Directed and scenographed by Debesh Chattopadhyay for Sansriti, the play once again proved the point that this Italian genius was essentially an academic (as a professor of Italian literature in a university in Rome); a playwright's playwright, whose writings veered from Modernism to post-Modernism in their complexity and web of intelligent reasoning; and whose entire dramatic oeuvre was aimed at presenting the point that the play "as it is wrote" can be vastly different from what the actors seek to present to the spectators. Second, the illusion -- created on the proscenium stage - can go miles away from how the protagonists - having lived the real-life incidents -- visualize the same in their own recapitulation. And third, the Aristotelian "unity of time, space and action" can become a nullity in the actual presentation of the play. No wonder, Pirandello was named the founder of the "Grotesque Theatre"! The performance took the form of a noisy entry of a motley group of characters - coursing their way through the auditorium to the stage where a theatre group was already rehearsing their own play -- clamoring that their real-life events be presented as a play. The distraught director, violently rebutting their intrusion first, reluctantly agrees later to listen to them and eventually agrees to alter his on-going script to accommodate the new realities that these characters have brought forth! Amidst many rebuttals to and fro, and a lot of consternation and tempers being frayed - particularly of those who were preoccupied with their own rehearsal work earlier - the events take some unexpected turns and seem even arbitrary and contradictory, and the play ends in chaos, but not without proving Pirandello's dying wish that his graveyard in his hometown should bear the epitaph: "Here lies the Son of Chaos!" Out of the uniformly brilliant teamwork displayed by the group, mention must be made of the petite Monalisa Chatterjee; she displayed exemplary guts and vivacity in the role of the stepdaughter, who had an affair with the man who had married her biological mother and betrayed her at the end. Kudos to the thespian Debesh who has given his viewers yet another important production that should merit many more performances!